The DRY TOUCH Gardening Glove is a very comfortable and durable glove which has been constructed using a softer, extremely pliable grain leather, which affords an exceptionally high level of dexterity. This glove also benefits from the leather having been specially treated to offer resistance to water, and would therefore be ideal for those seeking a glove to use in slightly wetter conditions. 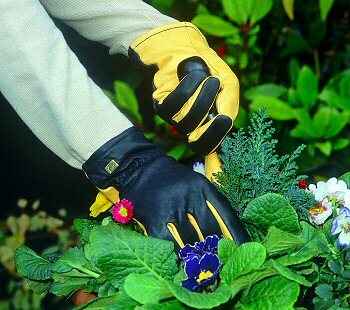 Additionally, this glove features a full lining throughout which results in extra comfort and warmth The DRY TOUCH is suitable for a variety of gardening purposes, such as potting, weeding and light pruning (for heavy pruning, we recommend the TOUGH TOUCH). Also available in ladies' size.